10-26 sea-air-land (SEAL) team detachments. The Explosive Ordnance Disposal Warfare insignia is worn by personnel who are qualified in the identification and safe disposal of many different types of ordnance produced by the United States, our allies, and our enemies. The Underwater insignia is worn by officer and enlisted personnel qualified in various classes of diving. The Underwater insignia is silver with the exception of the Diving Officer and the Diver Medical insignia, which are gold. The Seabee Combat Warfare Specialist insignia is worn by personnel who are qualified in all phases of Naval Mobile Construction Battalion operations including mobilization, combat operations, disaster recovery, and combat readiness. Most insignia worn by officers and enlisted personnel are identical, with one exceptionthose worn by officers are gold, while those worn by enlisted personnel are silver. Examples of some of these are Submarine, Small Craft, and Explosive Ordnance Disposal. Two exceptions to this are the Enlisted Aircrew insignia and the Naval Parachutists insignia, which are gold. Another type of special insignia worn by naval personnel is an identification badge, which is displayed by those engaged in Presidential service or assigned to certain staffs, such as the organization of the Joint Chiefs of Staff (JCS) or the Office of the Secretary of Defense. EMBLEM Different commands within the Navy have special emblems. Figure 10-20 shows one example of an emblem. REVIEW 3 QUESTIONS Q1. What is a striker mark? Q2. To be eligible to wear a service stripe, you must have served 4 full years of active or Reserve service in what branch of the U.S. Armed Forces? Q3. A naval officer is wearing one silver star insignia on the uniform collar. What rank does this insignia show? Q4. When worn as a sleeve insignia, what device designates the officer as a line officer? Q5. What kind of special insignia is worn on the breast by personnel qualified in underwater and beach reconnaissance and demolition? AWARDS Learning Objectives: When you finish this chapter, you will be able to Recognize authorized military awards. Identify the regulations governing their wear. 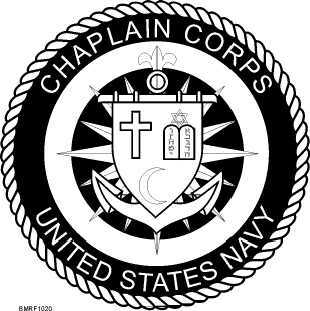 Student Notes: Figure 10-20.Chaplain corps emblem.